This green polka dot and four leaf clover design cardstock 5x7 Vertical folder is a perfect giveaway for your next St. Patrick's Day party or event. 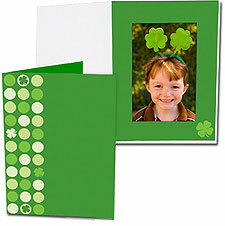 This Green polka dot and four leaf clover Photo Folder is a perfect giveaway for your next St. Patrick's Day party or event. Use as is or imprint with your company logo and text for your next Feast of Saint Patrick.